A lot of factors and options go into choosing the right automation sensor. Our Industrial Group has put together a list of Frequently Asked Questions for choosing the best sensor from Schneider Electric’s line of Telemecanique Sensors. 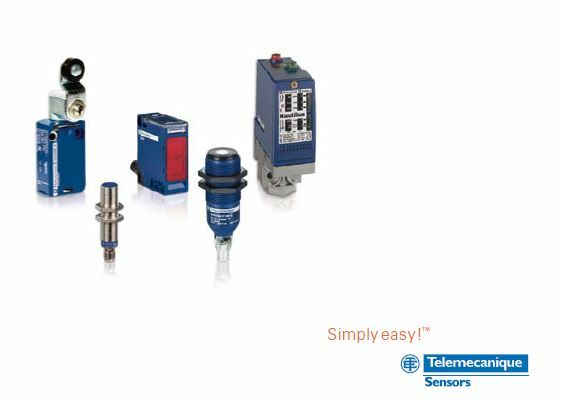 Telemecanique Sensors are the global leader in the sensors business, helping users select the right technology to get the best performance and reliability from machines in demanding applications. 1. What does a proximity sensor do? A proximity sensor detects the presence or absence of objects using various technologies such as electromagnetic fields, light and sound. They do not need to touch the object they are trying to see in order to detect its presence. 2. What are the main families of sensors? Inductive – typically the lowest cost and the shortest sensing distance. These sensors detect ferrous* metal targets. Inductive sensors come in shielded or unshielded versions. *Ferrous metals contain iron, and examples are mild steel, stainless steel and cast iron. Non-ferrous metals do not contain iron, and examples are aluminum, copper, brass and gold. Inductive proximity sensors work best with ferrous metals. Capacitive – Can detect both metallic and non-metallic objects. They can sense through non-ferrous materials, which makes them ideal for tank liquid level detection, monitoring through a site glass, etc. Ultrasonic – Uses sound waves to detect objects, so color and transparency do not affect their operation (though extremely high temperatures might). They are typically used for long range distance of clear glass and plastic, continuous fluid level control. The most common configurations are the same as photoelectric sensors -through beam, retro-reflective and diffuse. Photoelectric – The most versatile type of sensor, and used to solve the bulk of applications in industrial sensing. They can sense objects very close, or very far away, depending on the sensor selected. Each photoelectric consists of an emitter light source, a receiver, and supporting electronics to amplify the signal. The emitter, sometimes called the sender, transmits a beam of either visible or infrared light to the detective receiver. Photoelectric sensors can be purchased as through beam retro-reflective or diffuse. Retro-reflective – They have the next longest sensing distance. Like a through beam, they detect when a constant beam is broken. However, the emitter and receiving are in the same housing, facing the same direction. The emitter sends out a light source towards a specially designed reflector, which then deflects the beam back to the receiver. Detection occurs when the light path is broken or otherwise disturbed. They are more convenient to mount as wiring has to go to just one side. Diffuse – Like a retro-reflective, the emitter and receiver are mounted on the same side, but the target itself acts as the reflector. When the target enters the area of light, it deflects part of the beam back to the receiver, causing the sensor to detect the target and the output is turned on or off. 3. For inductive sensors, they are shown as normally open or normally closed. Why? If the sensor has a normally open output, its output is an on signal when the target enters the sensing zone. With normally closed, its output is an off signal with the target present. 4. What about light on and dark on? If output is produced when no light is received, the sensor is dark-on. It is light-on if the output is when light is received. 5. What pieces of information do I need to pick out a sensor? What are the color, shape and material of the target? How close can you get to the target? What is the available voltage supply? Is it AC or DC? What will be near the sensor face? If materials are very close, choose flush or non-flush mounted inductive or capacitive sensors. 6. What are the differences between RF7590 photoelectric grade reflector tape and RF3870 high intensity reflective tape? RF7590 has a higher temperature rating: 200 degrees F versus 150 degrees F for the RF3870. RF3870 has a higher luminance rating: 670X versus 200X on the RF7590. Neither are suitable for polarized retro-reflective applications. 7. Is it possible to false trip a Telemecanique XU series laser sensor with a laser pointer? No. All Telemecanique photoelectric sensors incorporate false pulse suppression. The sensor is not responsive to continuous wave radiation as from a laser pointer. The sensor only responds to the modulated beam produced by the companion laser transmitter. 8. What is the color of a XUZC80 retro-reflector? The XUZC80 is clear to white in color. Since a standard photoelectric sensor “sees” in grayscale, the color of the reflector has little effect on the total gain of the system.